Hope you are wearing your sunglasses lol. This week in stamp club we focussed on embossing folders & their many wondrous uses. 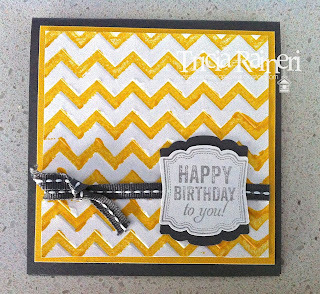 This card uses the inlaid embossing technique & we got to use some sneak peek products from the NEW 2013-2014 Catalogue which goes live July 2nd, 2013. It is very bright and fun - perfect for the 10year old I originally designed it for. I used quite a few embossing folders including the *New* Modern Mosaic embossing folder, Perfect Polka Dot & Square Lattice embossing folders. 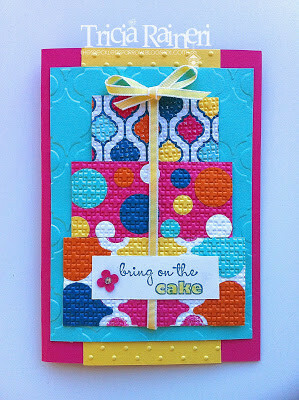 The sentiment is from Bring On The Cake one of my go to birthday sentiment sets. Here is a quick card using up some scraps on my desk & a little sneak peek! I was demonstrating how to use ink in your embossing folder at a class last week & was left with a Daffodil Delight chevron embossed piece of card stock. I like the look of Basic Grey & Daffodil Delight so made a little card 10cm x 10cm. 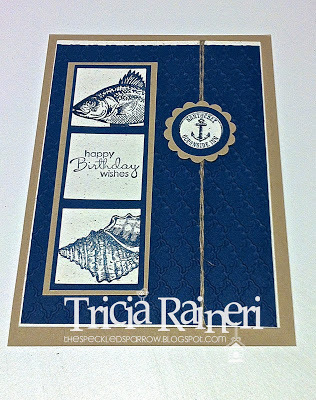 I used a new stamp set called Label Love & the new coordinating punch called Artisan Label Punch. Only 4 days to go until you can order this set for yourself. 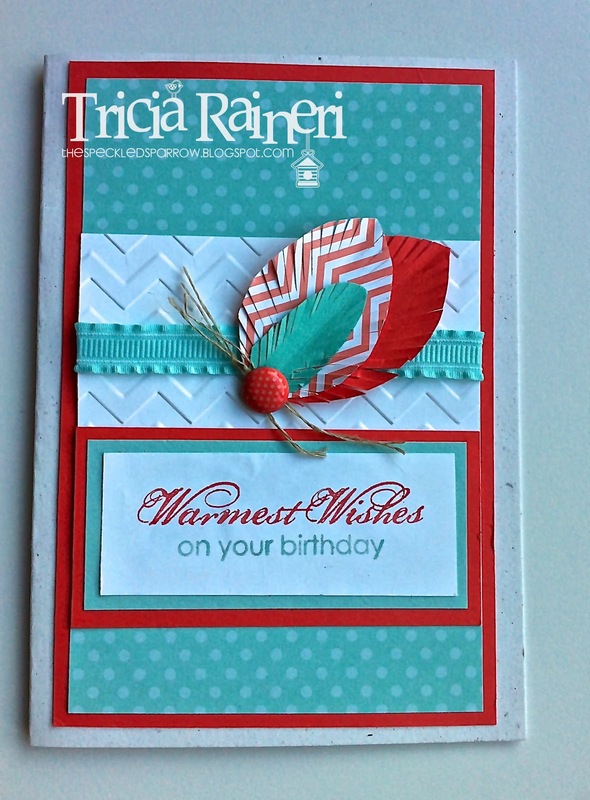 I recently held a class where we made a card wallet & created 4 matching cards & envelopes. We used the Secret Garden Framelits combined with some of the new 2013-2014 In Colours. If you are wanting to save 15% off this bundle, you have only one week left to purchase the Secret Garden set in a Bundle (131099 clear, 131100 Wood). They are only available in the new catalogue individually. This goes for all the bundles in the mini catalogue that ends 30th June. I am currently working on a PDF file for this class for those that are interested in the class for themselves. 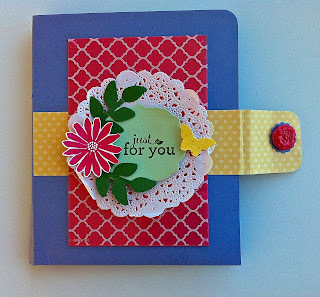 The Card folder is made from an A4 piece of cardstock, scored to create a holder for the cards. FOr this project I used Wisteria Wonder as the folder base & used the Quatrefancy Specialty DSP window sheet on top of Strawberry Slush. We also got to make some clay flowers using the new Buttons & Blossoms Simply Pressed Clay Moulds. Secret Garden In Colour Flower Wallet. For the cards I chose Pistachio Pudding (2013-2014 In Colour) as the card base & we used the new Modern Mosaic( New catty sneak peek) & the Honeycomb embossing folders. As I could only use preorder items I could not get my hands on any In Colour Ribbon so I made do with the retiring Wisteria Wonder Ruffled ribbon. Stamp Sets: Secret Garden (129144), Pop Up Posies Designer Kit (Just for You Stamp 131395), Various Sentiment stamps. Ink: Daffodil Delight (126944), Strawberry Slush(131178), Crisp Cantaloupe(131176), Wisteria Wonder (126985), Garden Green (126973). 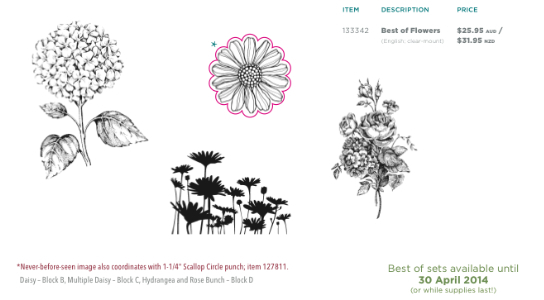 Cool Tools: Bigshot, Honeycomb EF(129378), Modern Mosaic EF(129984)Tea Lace Paper Doilies (129399), Ovals Collection Framelits(129381), Secret Garden Framelits(129372), Wisteria WOnder Ruffled Ribbon(122973 Retiring), 5/8" Organza ribbon(114319), Bitty Butterfly Punch(129406), Glue Dots(103683), Dimensionals(104430), Buttons & Blossoms Simply Pressed Clay Molds (131272), Simply Pressed Clay(130685), Crystal Effects(101055),7/8" Scallop Circle Punch(129404). 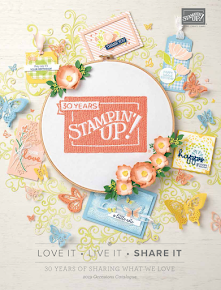 Whilst at the Stampin' Up! Convention a few weeks ago, I got to create a few Make & Takes. I wasn't feeling all to well that day so I partially created some of them & the rest I left for when I got home. A few days ago I got out my Make & Takes & finished a few off. I love the new colours, particularly the new In Colours so I tried to make a coordinating birthday card for the box we created. Here is the box we created at convention(I actually made mine at home as I wanted it to get home in one piece). It was made using the new Tag A Bag Gift boxes. The coordinating colours of Bermuda Bay, Calypso Coral, Coastal Cabana, Whisper White & Crisp Cantaloupe. All tied together with a Summer Starfruit stitched satin ribbon. 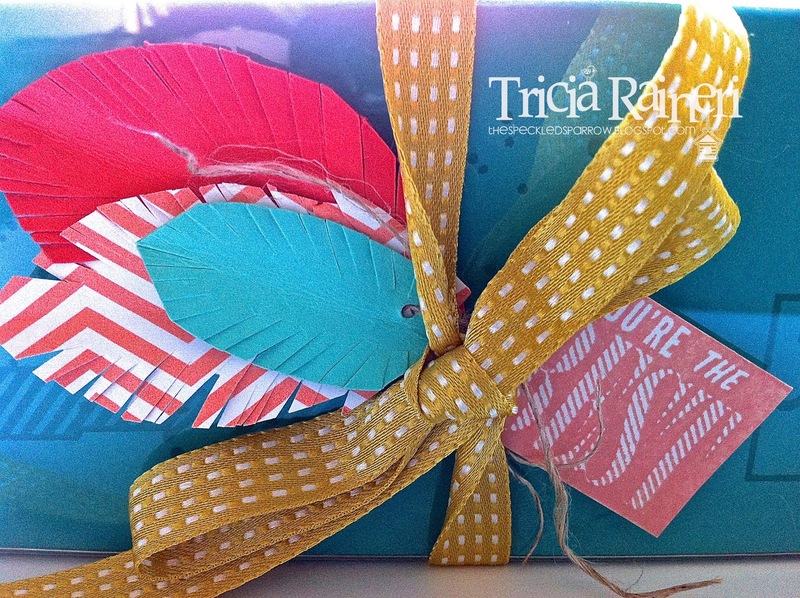 Feathers are the trend right now so I have created those with some paper snips & some circle & oval punches. There are 2 new stamp sets used here. Gorgeous Grunge & Hello Lovely. A friend of mine actually helped out with the make & takes at convention so I thought as a surprise for her Birthday I would make her a card using some of my scraps left over from the make & take kits. 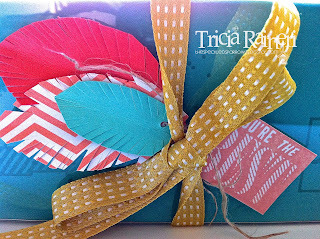 I don't have any of the new colours yet so I made do with Pool Party DSP, Calypso Coral & Naturals White cardstock. In the next few weeks you will see a few exciting sneak peak projects here, using some lovely items from the New 2013-2014 Annual Catalogue. I created about 45 swaps for convention & wanted to make a masculine card using By The Tide stamp set. As it was a swap it had to be super quick to make & relatively simple, without bling, ribbon etc. 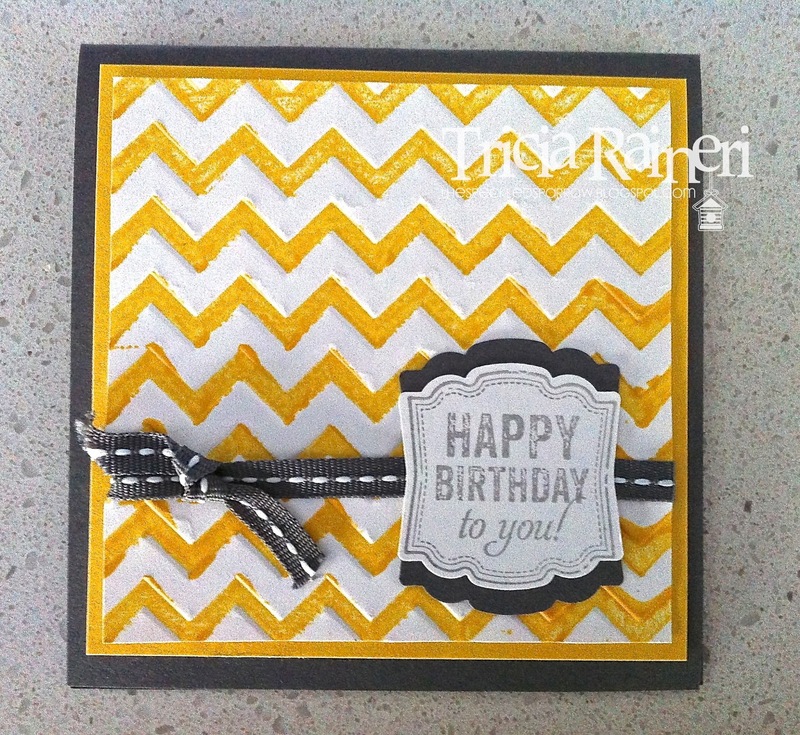 This sort of card would make a great beginner class card or a make & take at a party. My favourite colour at the moment is midnight muse so I based my card around that. 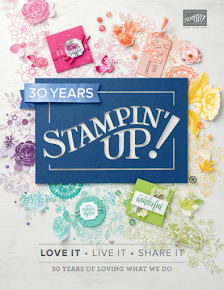 As part of the Stampin' Up! 25 Year Anniversary Celebration they are bringing back some of our all time favourite stamp images & combining them into 11 sets which will be released each month - until April 2014. Even better, along with some great classic images, each "Best Of" set will include a never before seen image! Check back here each month to see each set & download the flyer. This Month being the 1st month in the series is Best of Flowers- Item number 133342. Whilst you are shopping the retiring products or finishing of your wish lists why not add this great set. 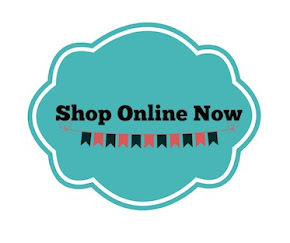 You can go direct to my online shop by clicking HERE. Stampin' Up! 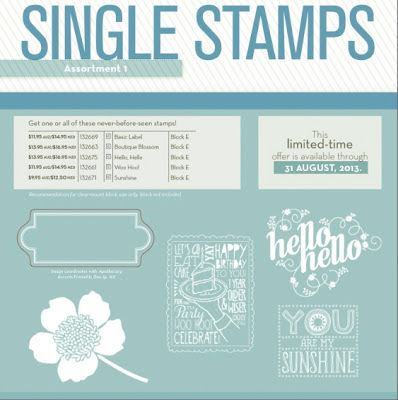 have also released some single stamps for you to purchase. WOW. 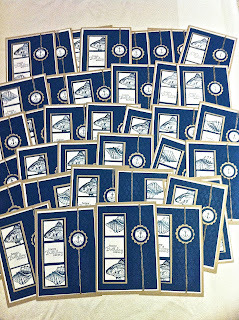 There are limited edition stamps and available from now until August 31st (while supplies last). You can find the stamp item numbers on the flyer. These won't be sent in our typical cases or packaging; they'll be packaged in cello bags. If you'd like a case for your stamp, you can buy our Clear-Mount Stamp Cases that come in packs of four. The stamps won't come with a Clear-Mount Block, and you'll need to purchase a block separately if you don't already have one. The recommended block sizes can be found on the flyer. There's no limit on how many stamps you can purchase. These stamps are only available through 31 August 2013, so get them while you can! Labels: Best of 25 Years Stamp Sets, June.